The new Pace Duotone foilboard is extremely versatile. It can be used for every aspect of hydrofoiling. The footstraps have many placement options making it work well fo a wide range fo foils. The track on the bottom of the board allows fine tuning of the foil position. 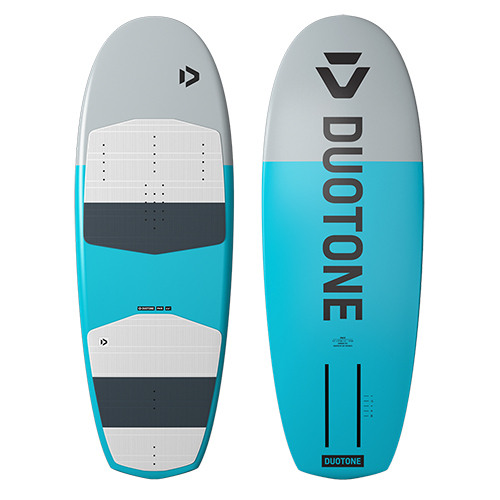 The new Pace de Duotone is a versatile board for foil with three available sizes: 4'3 ", 4'6" and 4'10 ". It has a convex geometry in its base, especially in the bow area that prevents it from submerging when it touches the water when landing and that prevents the songs from being trapped in the choppy while sailing in tight. Its wide bow offers a large surface and volume under the front foot that prevents the bow from submerging and facilitates gliding with light winds. The new Pace can be mounted with one, two or three straps and has a track support for foil. A great board for a smooth and simple freeride!